Harvest a Pound Every Three Weeks is now available! That’s right! You can now own your own digital copy of “Harvest A Pound Every Three Weeks”. The price is only $9.95. Everything in this book is new! All new designs for both the cloner and flowering units. This is also the first time that the new StinkBud Hybrid Aero/DWC plans will be available. That’s right, the system you’ve been waiting for is finally here! Now you too can grow huge 20oz. monster plants. Everything you need to know is included. 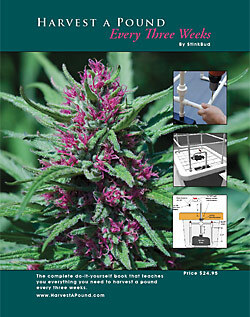 Plans, parts lists, tool lists, photos and instructions for four different Aeroponic systems. Grow room illustrations show you how to set up the system of your choice. Never before has such a complete do-it-yourself growing method been offered. So don’t miss out on owning a copy of StinkBud’s first book. This is history in the making and every StinkBuddy owes it to themselves to have a copy on their shelf.